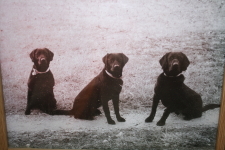 Our dogs are a vital part of our family and our training program here at our kennel. We constantly work our dogs to best help them to grow and be a asset to our training and breeding dogs for clients. For example Rudy our black male is the meet and greet guy that helps us to see the reactions from the dog being greeted. He tells me a lot about each dog being boarded or trained. Also he helps dogs in their training to become more comfortable at different steps of training. For instance rudy and gus has helped me with dogs in their sit stay drill, one or both sitting next to clients dog calmly till the recall is givin then they all come to a front sit, instead of just running around. The dog learns to be relaxed under distraction to focus on me but at the same time can see my dogs reactions as well. All our dogs are here to work at being the best at what ever level of training they are at. Our dogs are not here to breed more dogs to just produce a healthy or certain color of dog only. They are here for us and our clients to see future possible progress of their offspring based on what they are now, look,health,and what they can do. Each dog is not considered for breeding until we see how they do with total off leash training and the temperment that is most important for that task. In doing this we hope to provide you with not only a pup, but a successful relationship thats an important part of your family that can provide you with years of enjoyment.